The raccoon population is growing all across the U.S., and every year thousands of people have to deal with these critters. This causes many questions about the raccoon lifespan. 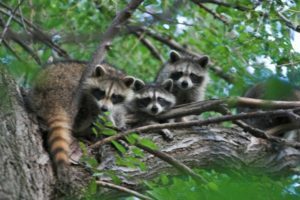 You may see raccoons if you live in out in the country or in a forested area, but metropolitan areas are often visited or inhabited by these animals too. Looking at things from a human point of view, you may quickly assume that raccoons are sturdy animals that can easily survive in any environment. In reality, the raccoon’s world is a tough one, and living to old age is not as easy as you may imagine. A raccoon lifespan varies considerably depending on where they live, weather conditions and, most important, if they live in the wild or in captivity. Besides habitat, raccoon lifespan also depends on which raccoon species they are. In this article, we will consider the lifespan of the so-called “Common Raccoon,” the species living in the vast majority of the U.S.
What Is The Average Raccoon Lifespan In The Wild? The raccoon world, like the human one, is not a fair world. As you will learn, the difference in raccoon lifespan between wild and pet raccoons is sizable, with the latter enjoying undeniable privileges. As is true for any wildlife, a raccoon living in the wild has to fight every day to find a suitable meal, escape predators and avoid other dangers. These are all life-threatening endeavors. The combination of these factors limits the average raccoon lifespan in the wild to 2–3 years. It does not sound like a long life, does it? In fact, the life of a raccoon is arduous from the very beginning. Only half of newborn raccoons survive their first year of life. This is a high death rate that negatively affects the average raccoon lifespan figure. But if a raccoon can make it through his first year, his odds of dying drop significantly. Some raccoons can live up to 5 or 6 years. There have even been reports of raccoons that lived up to 16 years, but that is definitely the exception. The typical raccoon habitat varies from area to area and it affects the raccoon lifespan. In particular, there are four factors that play a significant role in determining how long raccoons live: weather, diseases, natural predators, and human intervention. Weather. Cold winters can take an enormous toll on raccoons. When the winter is exceptionally cold and long, the critters are at a high risk of death. Even when a raccoon finds a suitable, warm den, perhaps sharing it with other animals to generate more heat, finding a meal during a harsh winter is still a real challenge. During these periods food is scarce, and a raccoon may suffer starvation and die. If a raccoon who dies of starvation is a mother with baby raccoons in the litter, her newborn raccoons are now doomed to face the same fate. With nobody taking care of them, they will die either of cold or starvation. Diseases. The most common cause of health-related raccoon death in North America is distemper. Distemper is a virus that often attacks raccoons. Once infected, the raccoon will experience respiratory and gastrointestinal problems, and his nervous system will break down as it is attacked by the virus. Distemper leaves a raccoon with only a tiny chance of survival, and young raccoons are the most vulnerable to the virus. Distemper is more likely to strike large raccoon communities. Often the disease becomes an epidemic, killing most of the raccoon population in the area. Natural predators. This is a danger common to all wildlife. 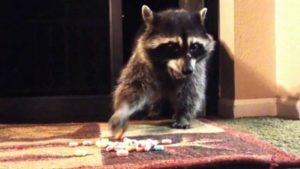 Raccoons make tasty meals for several predators. Bobcats and coyotes are at the top of the raccoon’s enemy list. Depending on where they live, raccoons can also become the victim of American black bears, cougars, alligators and bald and golden eagles. Young raccoons are even hunted by great horned owls. Even though the list of predators is not short, this is not the leading cause of death among raccoons. Many of their natural predators have been exterminated in parts of the U.S. As a result, the raccoon’s environment has become a lot safer. In metropolitan areas, natural predators may be entirely absent. Predators are still a danger for nearly every wild raccoon, but they are not the primary cause of death. Human intervention. A considerable portion of the American population hates raccoons. These critters are considered pests and real threats. In reality, it is exactly the other way around. Believe it or not, humans are by far the leading cause of death for raccoons. Looking at things from a raccoon’s point of view, we are the real threat and our behavior has a substantial impact on how long raccoons live. Sometimes the killing of raccoons is entirely unintentional. For instance, in areas with a high traffic volume, a significant number of raccoons are hit by cars. Other times, the killing of a raccoon is totally intentional and happens either out of hatred or in an attempt to get the raccoon out of the house. This is not the proper or humane way to get rid of raccoons, but unfortunately it happens quite frequently. Every year, hunting, trapping, poisoning and other human activities shorten the lifespans of many raccoons. What if a raccoon lives in captivity with somebody providing him a good den, delicious meals at regular intervals and a warm room during the coldest winter days? These raccoons are living in luxury, and comfort comes with an additional benefit. The lifespan of a raccoon living in captivity may extend to 20 years. Quite an impressive figure when you compare it to how long a raccoon typically lives in the wild! But sometimes even pet raccoons have to deal with a high mortality rate. Once again, human behavior is the decisive factor. Many people decide to adopt a pet raccoon without pondering the pros and cons of raising and taking care of such an animal. After a while, they are confronted with the many challenges of having a pet raccoon. Not only is giving a raccoon proper medical care expensive, but finding a vet who knows how to treat raccoons is not an easy task. Raccoons are not conventional pets, and many vets do not have the knowledge necessary for treating them. The wrong medical treatment or no treatment at all can quickly kill a raccoon. Once the raccoon is grown, he is not as cute as he was as a baby. His propensity for biting starts to kick in, and episodes of aggressiveness may occur. The difficulties of dealing with a pet raccoon are often overwhelming for many owners. As a quick fix to the problem, some raccoon owners decide to abandon their animals. Unfortunately, once raised in captivity, a raccoon has almost no chance of surviving in the wild. As you can see, even though a pet raccoon may enjoy several privileges, the length of his lifespan is often determined by the choices of his owner. Understanding how long raccoons live is important if you have to deal with the critters. If raccoons are regularly visiting your house, you should take immediate action to keep them away. Even though a raccoon’s lifespan in the wild is pretty short, you shouldn’t regard raccoons as a temporary problem. Raccoon droppings left in your garden or on your deck are highly hazardous to human health. Dealing with the danger for two to three years is not a risk you want to take. If the raccoon finds a way to enter your house, he can cause thousands of dollars worth of damage in as little as two weeks. Try to imagine what he can do during his “short” 2–3 year lifespan. In case you are thinking about adopting a new pet, how long raccoons live in captivity must be carefully considered. Taking care of a pet raccoon is not like raising a dog or a cat. It is a challenging task that not many people are ready to undergo. It requires time, patience, self-sacrifice, money and a certain measure of risk. Are you ready to endure all that for up to 20 years? As former U.N. Secretary-General Kofi Annan once said: “Knowledge is power, information is liberating.” This is an absolute truth — even when it comes to raccoons. Knowing how long raccoons live will help you learn how to peacefully be neighbors with this wildlife.